C) My piece? What piece? If you answered C), me too. If you answered A), getting close. A piece is a type of food. If you answered B), ding ding ding! You got it. A piece is Scottish slang for a sandwich. I learned about it last month when James and I were back in Glasgow (his hometown) for Christmas. Every time I visit, I come back with entire lists of Scottish slang I didn’t know. 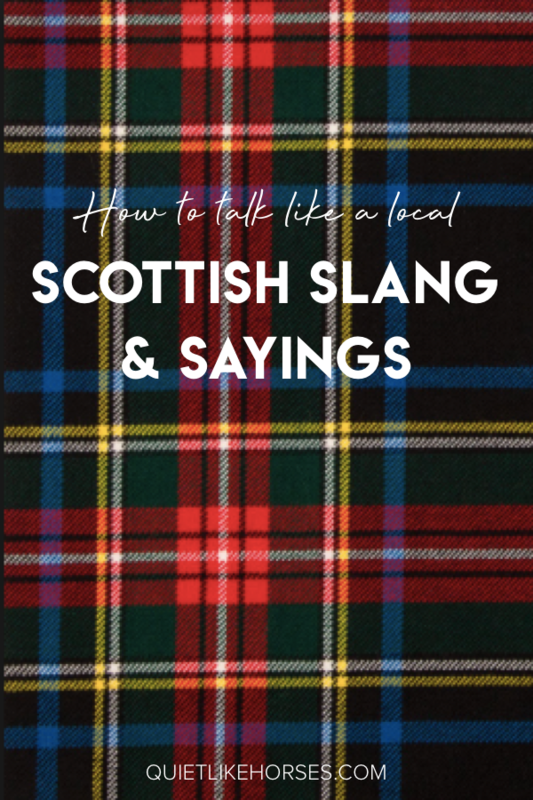 So whether you’re headed to Scotland soon or just want to brush up on your Scottish slang, keep reading to learn how to talk like a Glaswegian local. For a more substantial meal, ask for a fish tea. This comes with fish and chips, a cup of tea and bread and butter. For a breakfast sandwich, order a “roll and” XYZ. 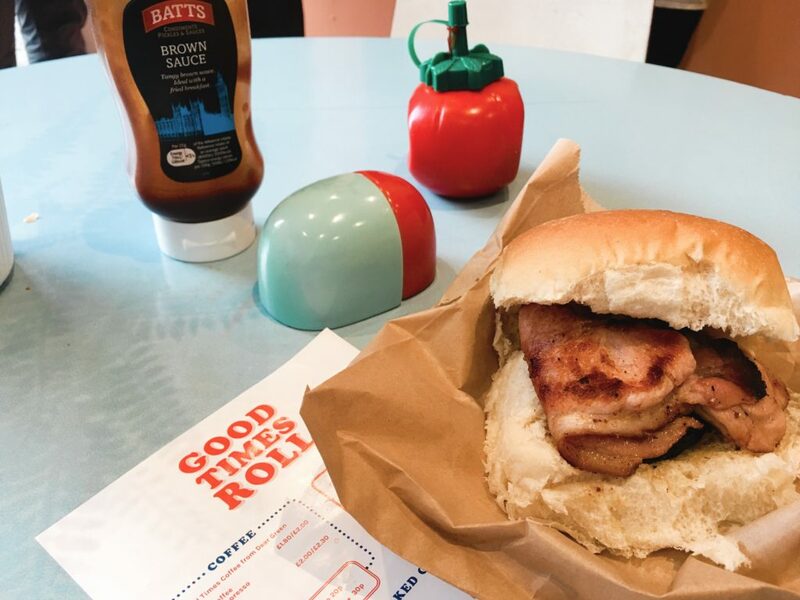 Scottish people are very particular about the makings of a good roll. It’s all about the bread. I watched a waitress serve a burnt roll to a customer, but James informed me that was actually “a well-fired roll.” People are crazy about them. Notes: Bacon, or back bacon as it’s called there, looks like a piece of ham. If you’re looking for bacon like the kind we have in the U.S., ask for “streaky bacon.” And don’t ask for cheese in your roll. It’s not a thing! Get crisps if you want potato chips. Cheese and onion crisps all the way. Get biscuits if you want cookies. Not quite like cookies, biscuits are in a category of their own. If you’re ever in Scotland (or anywhere in the UK), visit the biscuit aisle at the grocery store and you’ll see what I mean. 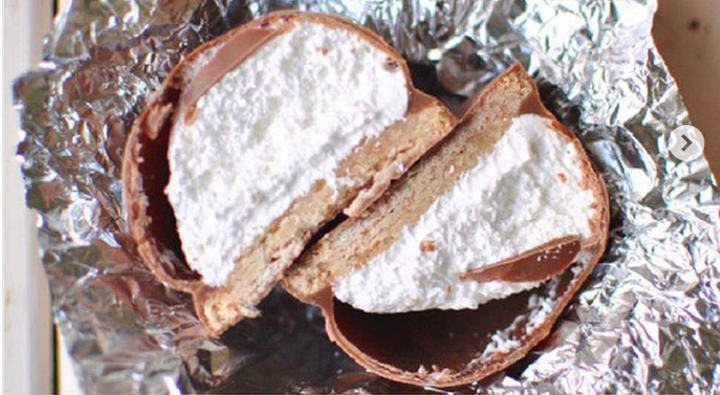 These dark chocolate Tunnocks tea cakes are my absolute favorite. When the sandwich came, instead of where my green pickle slices should have been, there was a chunky brown spread. “That’s pickle!” James said. A sweet, vinegary, pickled chutney, pickle is made of rutabaga, carrot, onion and cauliflower. It’s actually pretty tasty (if you like pickled things). Every guy is a boy, no matter how old they are. When we went to a football match, James’ brother went to “meet a boy” to get an extra ticket. Imagine my surprise when the teenager I pictured in my head turned out to be a 45-year-old man. Mangled. Another word for drunk, hammered, sloshed, or plastered. Chancer. Someone who’s in between dodgy and cheeky. Quite. “I quite liked it” or “It was quite good.” Sounds so posh, doesn’t it? Call someone big man. It’s kind of like calling someone “bud.” I thought maybe it was an insult in disguise until James’ best friend told me it’s his favorite. Call everyone mate. I wish we called each other mate in the U.S. It instantly sets a friendly tone. Say cheers instead of thanks. Ask for the toilets. Or ask for the wash closet. Just don’t ask for the bathroom or restroom. Underwear are called pants and pants are called trousers. I know. They think our names are silly, too. Sweaters and sweatshirts are called jumpers. Beanies are called wooly hats. Cutest name ever. Nae bother is no worries. Say yes to X. Skip the Os, and sign off on your emails, texts and notes with a single x or multiple xxxxx. Ehm is the equivalent of um. Drop an F bomb… or two or three. Mums say it. Grandmas say it. Everyone says it. Try using it in casual, non-heated conversations. Last but not least, if you want to talk like a local, be sure to pronounce the two main cities correctly. Glasgow is glaz-go and Edinburgh is edin-burr-uh. Have you been to Scotland? Did you hear any of these? p.s. Planning a trip soon? Check out my travel guides for fun destination ideas. I’m Sobrina and I’m so glad you’ve made it to Quiet Like Horses. Thank you! Headed there this hear and this will be quite helpful. Is there someplace you would recommend finding pronunciations for cities and towns in Scotland? We are driving all over the country for 12 days and should we need to ask for directions I don’t want to sound like a complete idiot. Hi Leah, how fun! You guys are going to have a blast. So I asked a Scottish person for you and his advice was to just ask people when you get there because people are friendly, and it’s better to ask than to just say the wrong thing. I know that helps to take some of the pressure off! Just a wee bit of advice about the f word. It is used frequently in normal conversation among friends but if you don’t want to be considered rude or aggressive, do not use it when speaking to non family or friends. Thanks for reading, Barbara! Hope you get to use some of these sayings soon. Sandy, have so much fun! I’ve never been up there, but it looks beautiful. Here a couple more for you to pass on though I’m sure your husband has told you them already. When someone says “Where do ya stay” They are asking “Where do you live”? If someone says to you if you would like it in a poke, they mean a bag. Though I haven’t heard this one of late. Another, have you got your messages? Means have you got your shopping. I have lived in Scotland now for 33 years and I am still hearing new phrases. You also have to take in different sayings for different areas. If you don’t understand just ask, no one minds. 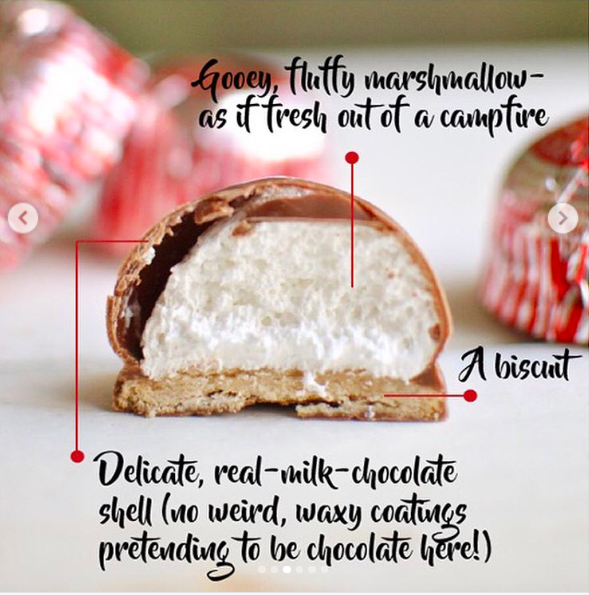 Oh, don’t forget to buy Scottish Tablet. Ask your husband about it. I hope all that come to Scotland will enjoy it and just remember if it’s raining just wait 5 minutes and the weather will change. I was originally from England but my family are Scottish and Irish. Thanks, Angela, those are some good ones. James brought some tablet home — it was interesting, haha! How interesting! My father grew up in Appalachia. His family is mostly Scottish/Welsh from waaay back, but they’ve retained a lot of the Scottish in their ways. He used “quite” a lot, as did his father, my grandfather. No one else around us spoke that way, but now zip see it was the Scottish in them coming out. Thank you for such an interesting article! I love it 🙂 Thanks for sharing about your family! I’ve been twice. My favorite place in the world. Explain what “See you, Jimmy” means. Have been to Scotland and have very few communication issues. Most importantly, they’re chips not fries. Most problems were understanding some with a very heavy brogue. I spoke as they had asked other children in that part of the city, Chinese, Turks, Greeks, to translate but none of the could, so what language did I speak? English of course, … but it might have been his Glasgow accent.